Today was the hardest ride of the year and probably my life. 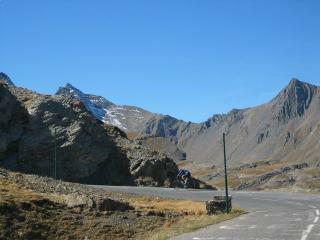 On a crisp beautiful autumn day, with the good fortune of having Doreen as my support car and photographer we drove the two hours from home and attacked the Grand Daddy of Tour de France climbs: the Col du Galibier. So bear with me for a long photo-filled post – click any picture to enlarge. 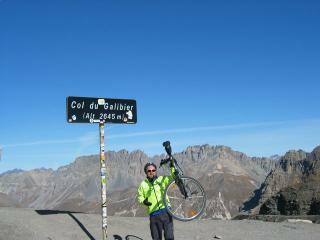 As the 3D Picture shows, Galibier isn’t a traditional col (mountain pass). 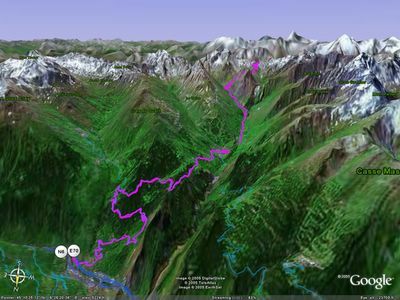 It virtually goes over the mountains – as you’ll see in the photos. At 2,645 metres (8,677 ft) it is one of the highest routes in the Alps – less than 200 metres below the highest. As usual, it was in this year’s Tour de France and is viewed by many as the greatest climb in France. I actually climbed the other (easier but hard) side in June, but had dreamed of doing this side. 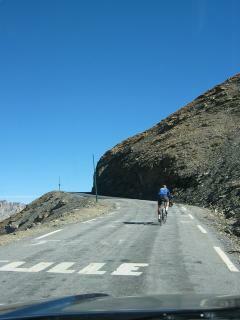 But the fact that to do it properly required doing the Col du Telegraph first had been a bit intimidating. 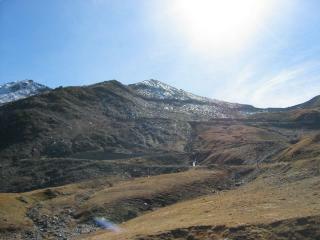 But the col is often closed due to snow by mid October, so it was now or next year. 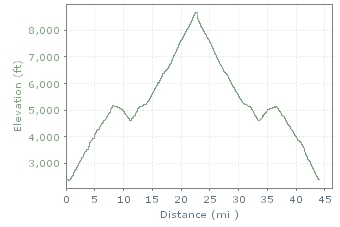 Here’s a chart outlining the elevation of today’s climb. 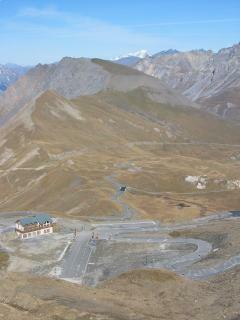 The first bit is Telegraph, then a 5km descent to the beginning of Galibier. 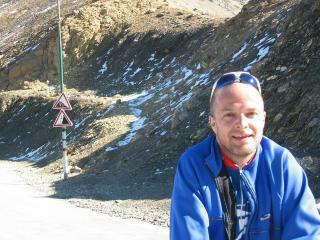 There and back was 71.5 kms with an ascent of 2,400 metres (7,800 feet). 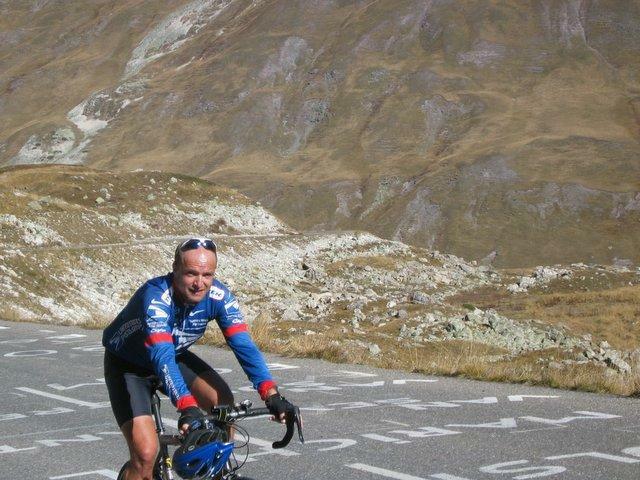 Before even starting Galibier , it’s necessary to climb the Col du Telegraph – and ascent of almost 3,000 feet (840 metres). This is a category 1 climb (the second hardest rating) and averaging 7% for 12 kms it is hard work in it’s own right – it took an hour. A beautifully clear autumn day. 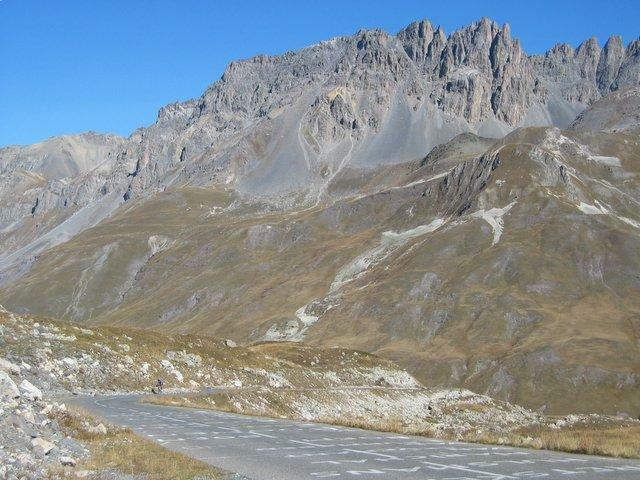 Telegraph is a sinuous climb through forested roads – the Galibier part is above the tree line, making for two very different routes. Posing allows a brief rest. Woohoooo. Made it. I must say I felt fit and comfortable climbing Telegraph and was constantly telling myself to slow a bit as I knew any wasted energy would cost me later. But I was in pretty good spirits at this point. 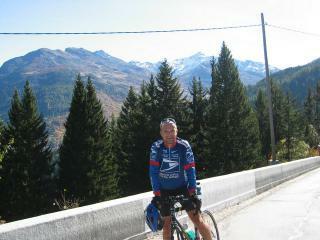 After Telegraph there was a 5 km descent into the ski resort of Valloire. I cursed every lost metre of this descent. The next 9 kms from Valloire ranged from a flattish 2% to a steep 9% and it was tough to get a rhythm going and I was a little tired. I did my best to eat and drink a lot and kept plugging away. 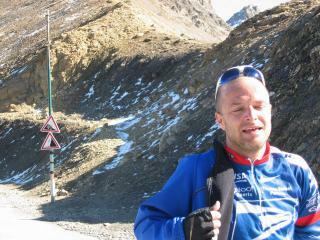 After a few kms a head wind started up. So … I’ve been climbing for over 2 hours, I’m getting tired, oxygen is getting thin (?! ), there’s a head wind, AND I happen to know that the hard part hasn’t even started. But I am enjoying myself. 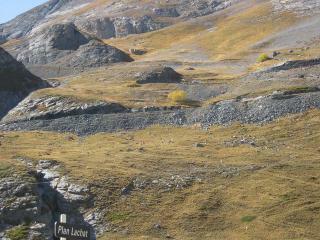 With 8 kms to go there is a little hut and a restaurant at a place called Plan Lachat – and here the road suddenly turns up the side of the mountain. This is where Galibier gets crazy. I am the little tiny speck crawling up one of these hairpins. The scenery is spectacular and extreme. Increasingly I can only shake my head and keep turning the pedals. Doreen has driven by twice and yelled "this is crazy." Here I am approaching a stretch where you can clearly see the road graffiti left over from the Tour de France. It’s always fun to read and covers dozens of climbs all over France. German and Dutch fans in particular have made road painting a science using colours, templates, big huge rollers, paint that lasts for ever, and sometimes a scathing sense of humour. I often see a big "Armstrong" painted accross the road with an arrowed line heading over the edge…..
I’m the little sweating speck. No comment … keep pedaling …. I am getting a little tired and the road is getting steep. But I’m approaching the snow-line and making progress. I knew this would be painful. With about 3 kms to go I began to perfect my new head down style – tired! The end in sight! The last 2kms are evil hairpins that are scary to even drive. 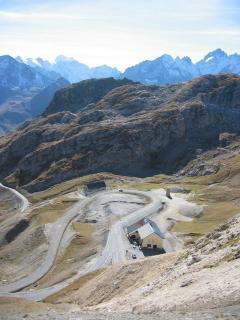 In fact 100 metres below the summit is a tunnel allowing cars to bypass the last kilometre or so. The last half kilometre. I am swerving a bit here. This shot looks down from the top to the restaurant by the tunnel and the way I have come from. Pretty much straight down for the last kilometre. OK, I’ve made it. Give me a minute please – I am knackered. Ok, feeling better – I can almost smile. See the 10% grade warning sign in the background and the danger falling rocks sign. Interestingly (?!) I saw a falling rock by a falling rock sign earlier in the day. One thing I have learned that is now matter how hot it is climbing, it is usually freezing descending. So I put some pants on, two jackets, my helmet and some warm gloves. Another added bonus of Doreen helping today: I switched bikes for a safer descent. The top is just a little area. This shot shows the way up from the other side and the exit from the tunnel. THe other side is pretty nuts too. I am at home now writing, tired but happy. A great day. Galibier and Alpe D’Huez in one day – Possible or Crazy? I’m an intermediate cyclist with no real elevation experience. I live in Massachusetts, so my options for real mountains are pretty limited. I hope to try and complete Mt. Washington in a few weeks. 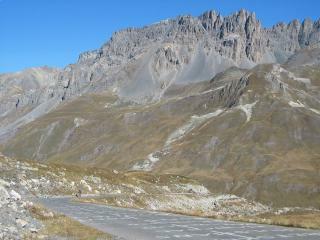 First, despite the fame of Alpe d’Huez, Galibier (the north side with telegraphe) is far harder and more beautiful. It would be my first choice if you do only one. It takes me almost 3 hours. As to do doing both. It truly depends how strong you are. See the current headline article here (La Marmotte). 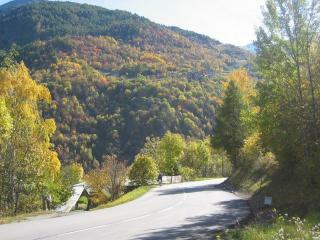 On Saturday, 8000 cyclists are going to try and do both plus Col de la Croix Fer (also hors category). So it’s crazy but more than possible. Commenting from the my hotel room on Alpe D’Huez. 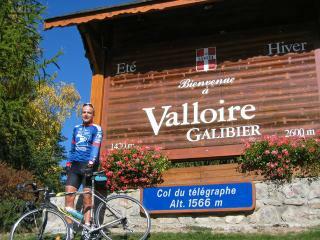 I climbed Galibier via Telegraphe yesterday and Alpe D’Huez this afternoon. I was able to get myself two days out here and my only regret is that it wasn’t 4 or 5! It’s eerie to re-read your ride report now and see how similar my experience was to yours, kilometer for kilometer. Thanks for the info! 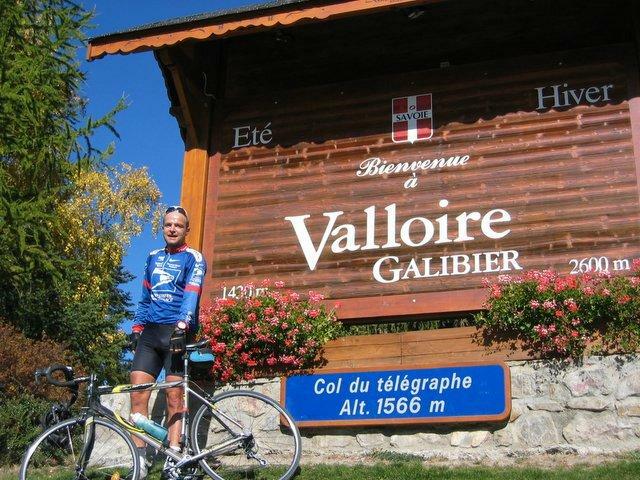 Hi Will, I’ll be spending about 5 days in the Alps in July during the TDF and was planning to do Galibier via Telegraphe. Once I reach the top of Galibier is it possible to descend to the N94 road and ride to towards Le Bourg D’Osians? Danilo, Yes, you can descend the other side of Galibier. The first 8.5 kilometres to Col du Lautaret are beautiful. 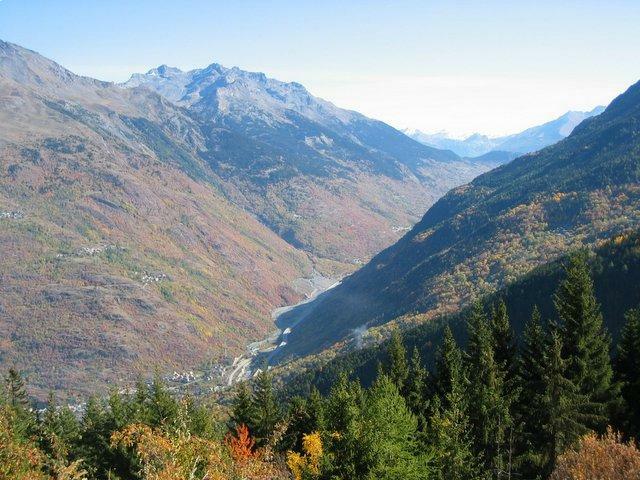 After that you join a busier road – but still nice – and must descend through 10 shortish tunnels to Bourg d’Oisans. Personally, not my favorite stretch of road on a bike due to some traffic and the tunnels – but thousands ride it. 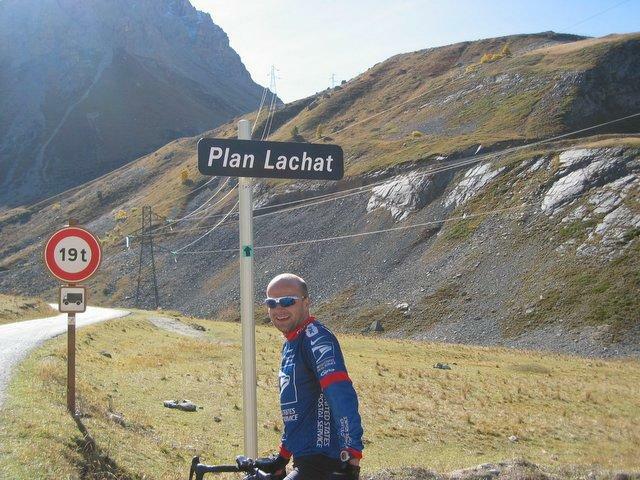 Planning to do the Etape du Tour this year, over the Telegraphe, Galibier and Alpe D’Huez. I would be interested in knowing the gearing that you used and how many miles a week you rode prior to your ride up the Galbier. I am not the strongest cyclist. My easiest gear is 30×27 and I use it for most of the climb. I usually ride a little more than a hundred miles a week … but usually fairly hilly. 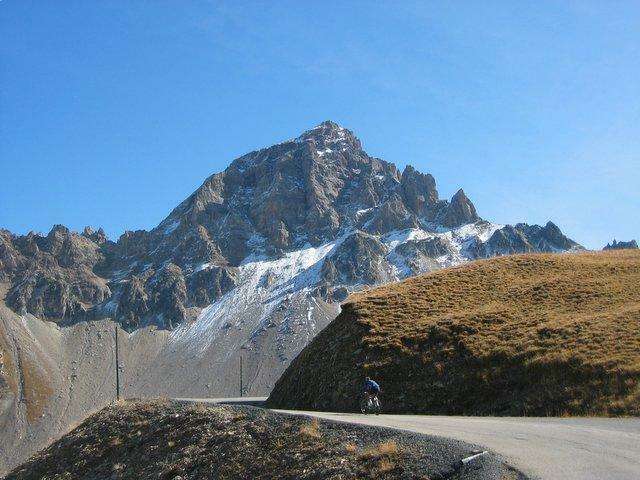 We cycled Telegraphe & Galibier . (13 July 2012) The best day of cycling I’ve ever had. To say it was hard is an understatement , but the when you reach the sumit of Telegraphe it’s just fab. Down the other side & into the valley on route to the Galibier , we were in ore of the size of the mountain . The last 5k were brutal , but believe me when you reach the top of the ‘monster’ you will be over come with emotion. Two 48 year old males brought to tears……….not a pretty site I can you!! . If anyone asked me to do it again……. NEVER, well maybe , possible, il think on it. Anyone thinking of going to tri, go for it cos you haven’t cycled till you have stood at the sumit of the Galibier looking down at 2634meters of pain & pleasure . So the Northern side of the Galibier is the more enjoyable descent, I take it? i’m planning to do the Galibier soon, but I haven’t decided which side. Bearing in mind that I consider climbing a means to an end, which would you recommend? I’ve done the descent from Col du Lautaret and I found it pretty uninspiring, in agreement with your description.